Notes: Although officially known as South Canterbury the station was always shown as Canterbury South on tickets and station nameboards. South Canterbury station was originally to have been sited further north at Wincheap on the north side of the Canterbury to Ashford, but the South Eastern Railway was unable to purchase the land. An alternative site further south was found, but the company was not able to purchase this until 1890. The landowner allowed the company to build the station before the purchase of the land had been completed and, although opened with the northern section of the line on 1 July 1899, it was not completed until well after that date. When the station opened it was at the very edge of the town and, although eventually there was some development, it is doubtful if the station ever generated much traffic. 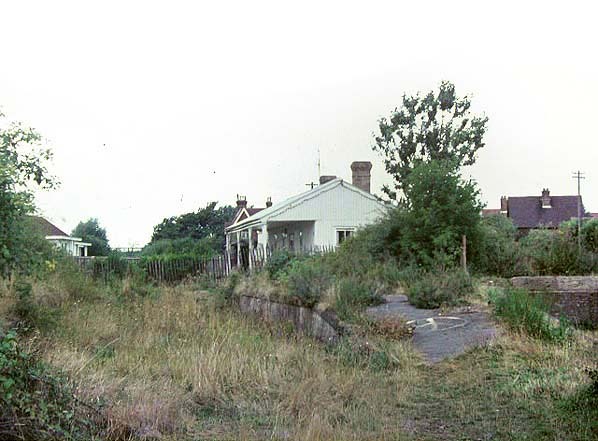 A stationmaster's house was provided at the north end of the station, although in later years the station came under control of the stationmaster at Canterbury West, and the house was leased out; the house still stands today. South Canterbury station was busy only during Canterbury Cricket Week when special trains were provided, the station being conveniently situated for the ground. The three stations on the northern section of the line were expected to generate less traffic that those further south, and they were provided with cheaper buildings bought from an outside contractor. 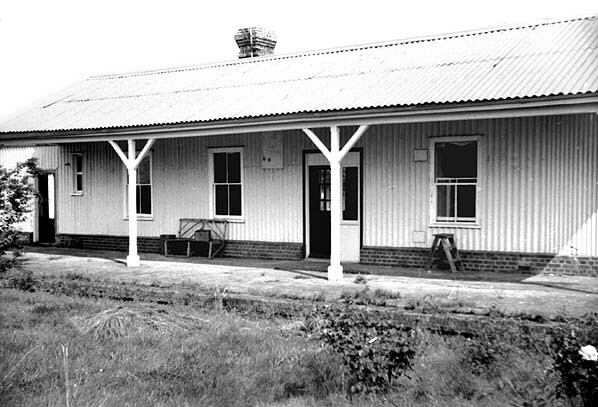 The single-storey building at South Canterbury was corrugated iron over a timber frame and was similar to some stations on Colonel Stephens' light railways. The SER provided a standard waiting shelter and signal box. South Canterbury had a small goods yard with a single siding on the down side of the line, with a cattle dock running behind the south end of the down platform. Access to the yard was controlled by a signal box beyond the south end of the up platform. Throughout its life passengers crossed the line using barrow crossings at both ends of the station. There was a footbridge 400 yd south of the station, but the SER did not consider it necessary to re-site it close to the station so that it could act as a station bridge as well. 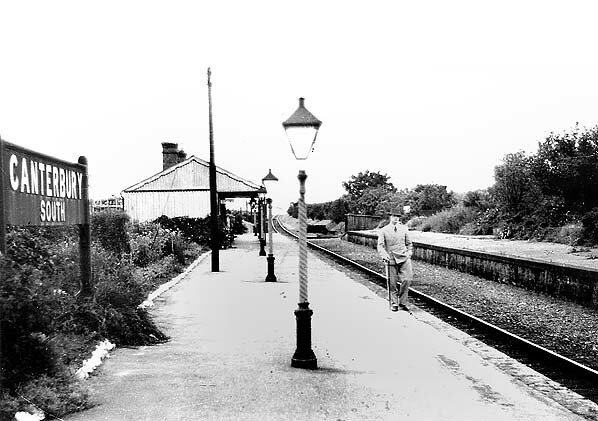 In 1931 the line was singled, and the up platform was taken out of use; the signal box was demolished at the same time. On 25 October 1940 the passenger and goods services through South Canterbury were suspended when the line came under military control; the loop through the station was re- laid for military use. The station officially closed from 1 December 1940. The goods service was reinstated on 19 February 1945, but it was short-lived as the line closed completely on 1 October 1947. The station survived until c.1969. Norwood the Dover line would then share the London and Brighton main line to Redhill where it would turn east towards Tonbridge, Ashford and Folkestone. owned Bourne Park House on the northern section of the line. Bourne Park is an attractive three-storey red-brick Queen Anne mansion overlooking water meadows, and once visited by Mozart. It is set in scenic grounds with a large ornamental lake and a long avenue of elm trees at the rear. a landowner, and the work is described in Matthew Bell's Chronicles of Bourne: ‘An open cutting was made as deep as the level of the arch springing and then a trench was dug on either side on which the walls of the tunnel were built. The arch was then turned, but with apertures left in it at regular intervals. Lastly the core of chalk left in the middle of the tunnel was removed by being hauled up in wheelbarrows on chain bridles, through the apertures, drawn by horses. The core was then deposited on the top of the tunnel until the cutting was filled to the original level.’ The bricks forming the roof of the tunnel were laid in early September 1888, and the tunnel was completed in February 1889. To finish the tunnel, chalk from the excavation was used to cover the arch, which was then topped with a thin layer of soil to restore the land to its original level. 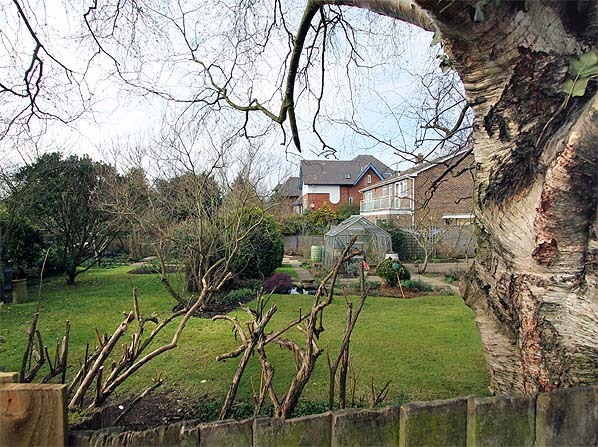 Matthew Bell, however, never came to terms with the loss of part of his elm avenue. service also operated at weekends, and Sunday excursions soon proved very popular. Motive power generally came from Dover shed although there was also a shed at Canterbury West. During the early 1890s competition between the SER and the LC&DR reached ruinous proportions, with both companies offering nearly identical services to and from the same towns, which inevitably lost money for both companies. However, following the resignation of Watkin in 1894, relations between the two companies gradually improved under his successors Sir George Russell (1895) and, most notably, under Cosmo Bonsor (1897). Bonsor managed to persuade the two boards of governors to see sense, and from 1 January 1899 the South Eastern & Chatham Railway’s Joint Management Committee was formed to oversee joint working, with Bonsor as its chairman. On 5 August 1899 the South Eastern and London, Chatham and Dover Railway Companies Act was passed, which resulted in the formation of the South Eastern and Chatham Railway. The new management had little effect on the Elham Valley line. were allocated to Dover shed and were tried on the Elham Valley line in 1911. They were used during the summer to supplement the existing service between Folkestone and Elham, with four daily services. The rail-motors struggled with the gradients up to the Etchinghill summit and in 1914, having been reduced to two a day, these services were withdrawn completely in 1916.
unaware of the upheaval that was to follow at the end of the decade. By 1937 the passenger service had been reduced to five daily trains. The outbreak of war in 1939 initially brought few changes, but by 1940 a German invasion was expected. On 25 October the passenger service between Lyminge and Canterbury was suspended, and the military authorities took control of the line for the duration of the war. Passenger trains continued to run between Lyminge and Folkestone, although Cheriton Halt was closed for the duration of the war. The daily goods train service continued under the control of the War Department; the WD also ran a service of recreation trains for military personnel on Wednesdays, Saturdays and Sundays. The general public were allowed to use these trains ‘at their own risk’, and special tickets were issued. which could bombard targets in France; secondly there was need for intermediate-range guns capable of hitting enemy shipping in the Channel; and, lastly, there was a requirement for mobile super-heavy rail-mounted guns which could be used against shipping and artillery targets and, if the need arose, be withdrawn to pound the invasion beaches. insistence that an unnecessary tunnel should be built so as not to spoil the view from his bedroom window. Elham. These were replaced by two 12-inch guns of the 8th Battery, 2nd Super Heavy Regiment in 1942. At the beginning of May 1943 the Southern Railway withdrew the passenger service between Lyminge and Shorncliffe; thereafter the Military were the sole users of the entire branch. The Elham Valley Military Railway provided its own passenger trains for military personnel, but members of the public were allowed to travel on these at their own risk. Special tickets were issued, with an example shown below. After the war, Boche-Buster was taken to the Royal Arsenal, and it was cut up in the early 1960s. No railway guns exist today although one of the 18-inch barrels is still kept at Shoeburyness. Junction in September 1948, and track lifting continued southwards. When the contractors reached Barham all work stopped, and it was not until the summer of 1953 that track-lifting reached Elham. Track-lifting was completed in 1955, followed by the removal of bridges over roads. Route map drawn by Alan Young, Bradshaw from Chris Hind, tickets and SEC timetable from Michael Stewart except 2285 Brian Halford. 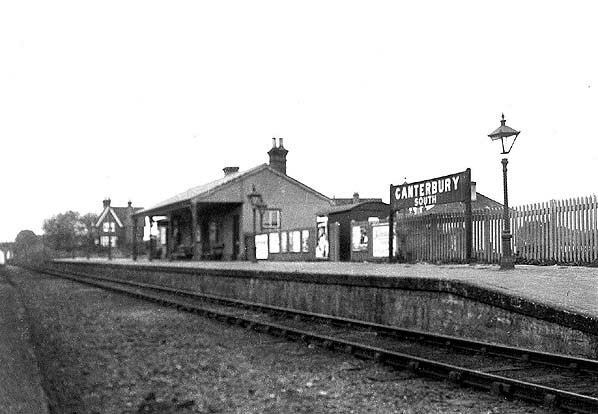 Canterbury South station looking south-west from the down platform in 1936. The trolley shed at the far end of the up platform stands on the site of the signal box. The station building at Canterbury South station in June 1968. Canterbury South station looking north in May 1969. Looking north at the site of Canterbury South station in March 2012.